Oh Monday, you have come so soon! As my humans walk out the door they remind me that they work hard to give me a better life. I have a busy week planned with a review and giveaway, sharing a new doodle product as well as testing out an interactive toy that is keeping me busy while it is cold outside. Make sure you stop back and check out all the fun! Happy Monday Everyone, I hope you all had a wonderful weekend. I have a busy week for you all so lets get started. Today I’m sharing with you a wonderful company called Flagology. Flagology was started in 2012 by a working mom named Susan who couldn’t find a flag that expressed the unique personality of Bella, her Chihuahua-Dashshund-Terrier mix. So she created one of her own. 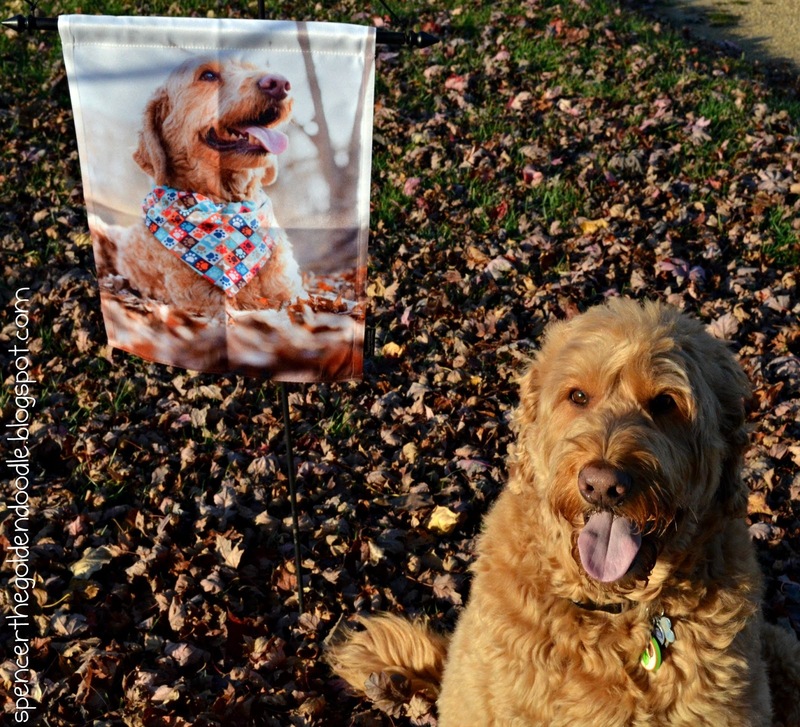 Soon after that, Susan started getting request from friends to print flags that celebrated their special pets as well. And so Flagology.com was born. My humans can relate to Susan, since I’m a mix breed as well, it is hard to find Goldendoodle items/decor. 2) Choose your design either: photo, monogram, or address flag. You will find there are several to choose from in each category. 3) Upload a photo from either a file, Facebook, or Instagram. 4) Add text, change the font, choose your flag color, or add a clipart. *Flagtastic Fabric – is their premium quality outdoor fabric perfect for photo flags. *Flip-It Fabric – is their premium quality outdoor double sided fabric perfect for text and monogram flags. 6) Place your order. Prices start at $24.99. Once you have completed your design and have placed your order, your custom flag will be shipped to you in as soon as 5-7 business days! Quality of the Flag – The quality of the flag is impressive. Not only is it tough enough to withstand the elements outside, it is also thick and silky make it a great piece to show off inside your home as well. Ordering Process – Ordering was easy, simple, and fast. But at the same time you have many options to choose from as well as many options to customize your flag. Price – $24.99 for a custom flag that is made from quality fabric is a bargain. Speedy Delivery – I was shocked when I saw my package in my mail box only 4 days after I placed my order. I’m sure with the holidays coming delivery times will be slowed down a bit. However, to get a custom order in a week is outstanding. I’m over the moon with this company and this product. The only downside I found was not knowing about this company sooner. 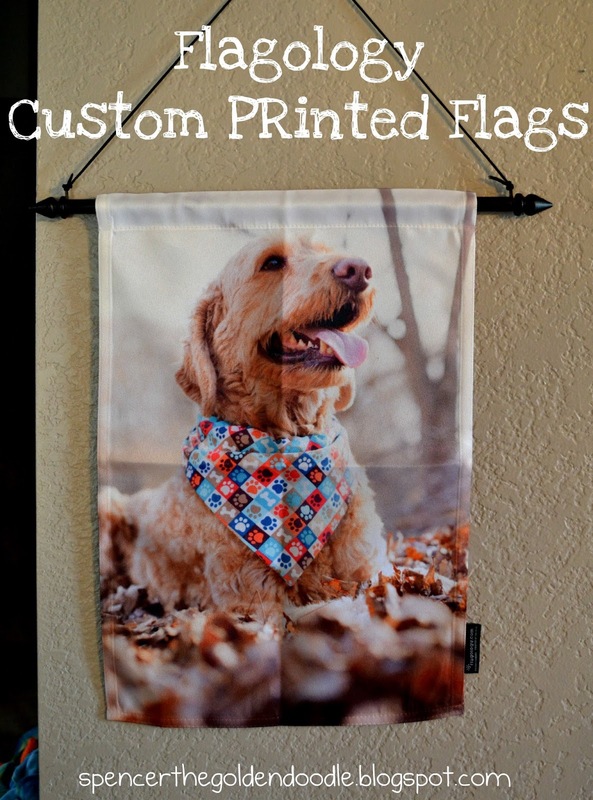 Flagology would make a wonderful, custom gift for the dog lover in your life. 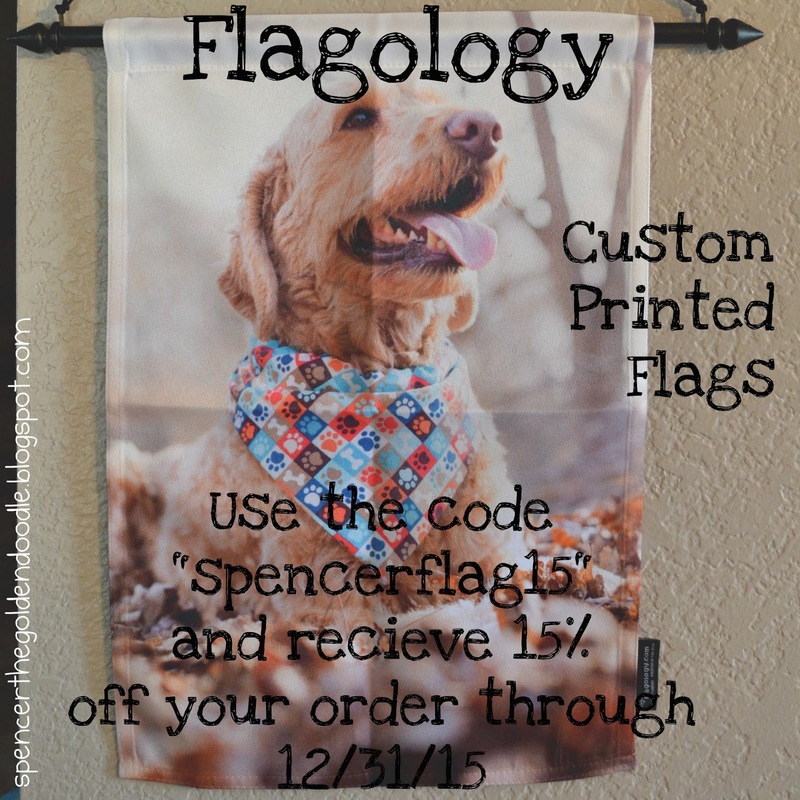 Make yours today and use the coupon code “spencerflag15” and receive 15% off your order through 12/31/15. December 16th is the deadline to order a flag with overnight shipping and a guaranteed delivery by Christmas Eve. To learn more about more about Flagology visit them at any of these sites: Website, Facebook, Pinterest, Intstagram, and Twitter. 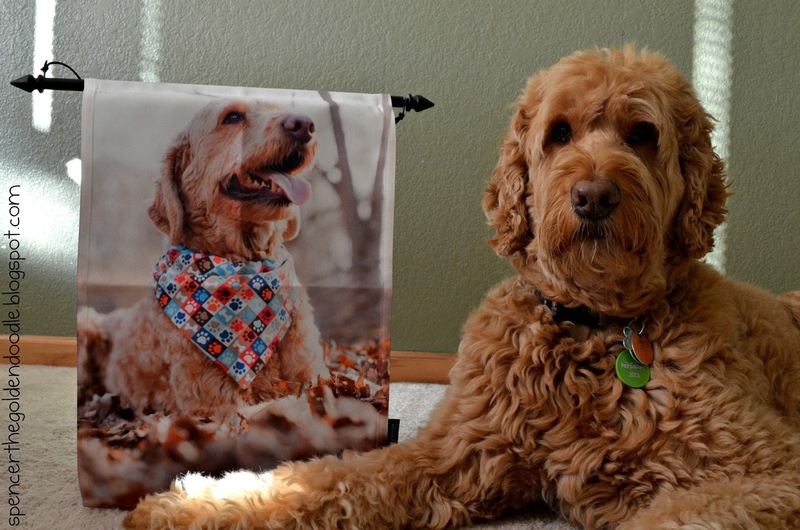 *Spencer the Goldendoodle received this Flagology flag in this post to review. 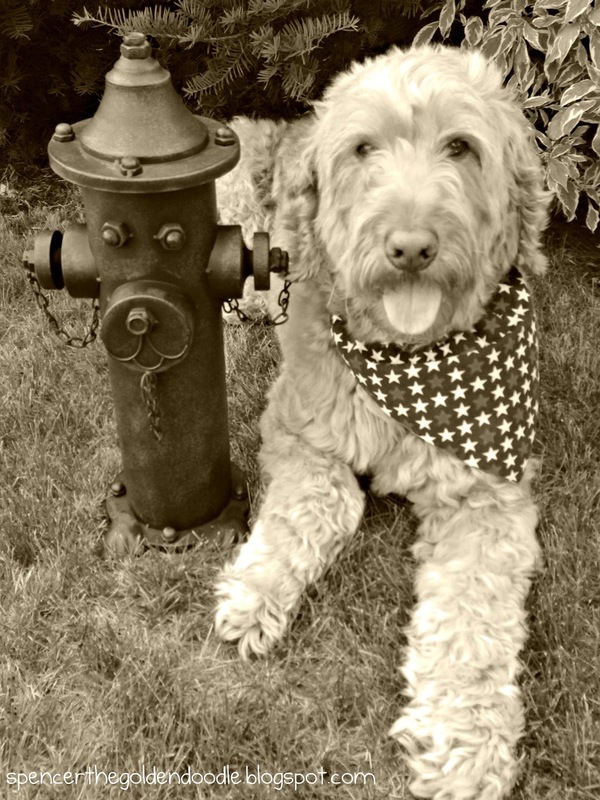 Spencer the Goldendoodle receives no additional benefits from posting about this Flagology products or the company. 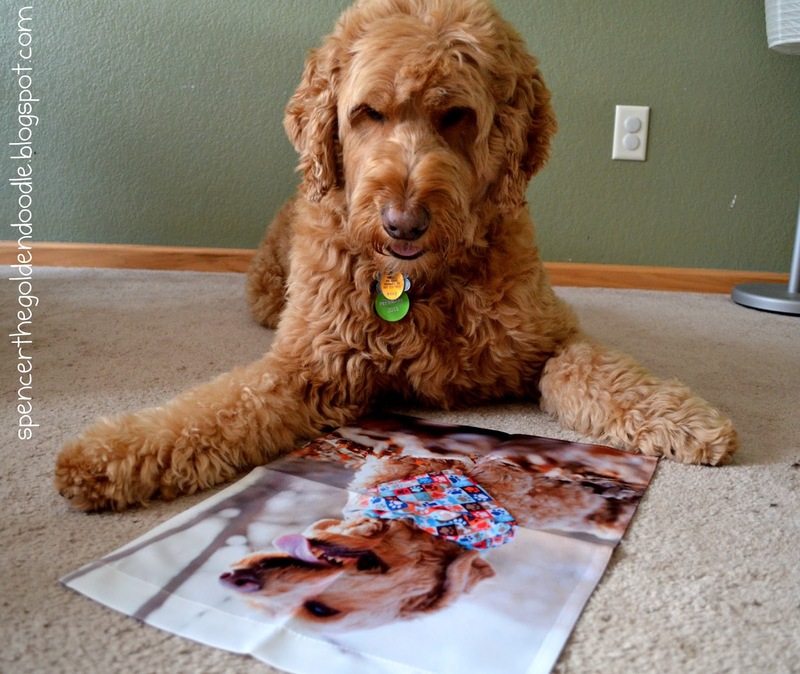 The opinions in this review are the honest opinion of Spencer the Goldendoodle. Flagology is not responsible for the contents of this post. My mom scored an amazing deal yesterday. She has been eyeing this little guy at JoAnn Fabrics for a couple of months now. Unfortunately, he was way out of her budget at $79.99. That is a lot of treats. But yesterday, she found this fire hydrant in the clearance area for $23.99. No questions were asked, it is now mine. And no, it isn’t for peeing on! This past fall I won a pair of tickets for the spring Junk Bonanza here in Minnesota. Well, it wasn’t really me, but my mom used my accounts to enter for a chance to win, and guess what, she won! Since it is my mom’s 30th Birthday on Saturday I’m considering this her early present from me. When people hear the work “Junk” most people think of rusty, old, useless stuff. But, if you look beyond the surface you can find purpose in these old items. For example, using an old mason jar or an old flour container for treat jars. My humans turned two old wire baskets into a small toy basket or a place to hold my tools. And my favorite, is an old bowl as a water dish. Last year my mom picked up a new toy box for me. As you can tell it is able to hold all my toys, with room for more. Now, what uses could my mom find for this antique, metal bed pan??? Possibilities are endless!! !